Complexity is here to stay, get used to it! Complexity is a hot topic in organizations lately. Technology increases the number of factors that affect our business at an astounding rate. I am more and more convinced that the way we manage organizations is a sham, designed to give the illusion of predictability, but really having little effect on the outcome. In chaos theory, the well-known example is the Butterfly Effect: “when a butterfly flaps its wings in Australia, it causes a tornado 2 weeks later in Kansas.” The point here is that small, seemingly unrelated factors that are impossible to trace, can cause large impacts. Think about how the butterfly effect impacts your work. Suppose you are working on a project and government regulations change, rendering your project illegal. Or a competitor swoops in with a better product making your obsolete. How many times has an unknown risk blindsided you and completely thrown your plans off track? And on the flip side, sometimes a stroke of luck can cause great success. In order to better manage in our complex world, our fundamental model for managing organizations must change. 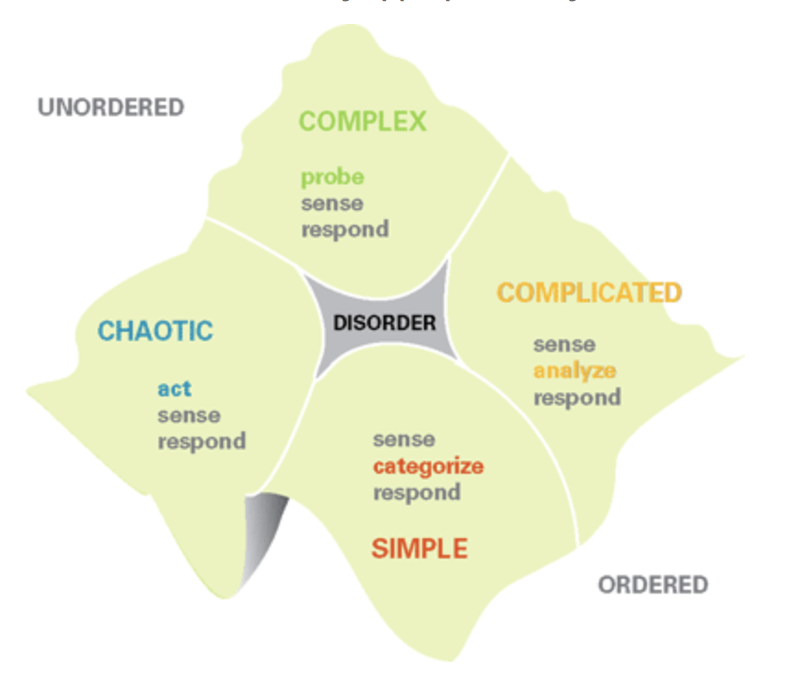 Dave Snowden published a sense-making framework called Cynefin (pronounced KUH-ne-fin). I’ll admit that when I first saw this framework, I thought it was an interesting observation but I couldn’t understand how to make it useful. Over the years I’ve come to appreciate the usefulness of the ah-a moments that people have when they realize they are managing for complicated situations and not complex. The main difference as we move from complicated to complex is that you can’t analyze your way to success. Think about the butterfly example, it’s not feasible to prevent tornadoes by controlling butterflies in Australia. What does make sense is to build systems to probe or test for likely events. In the case of tornadoes, we now have systems to track weather patterns, barometric pressure, dark clouds, etc. The chaotic quadrant still doesn't sit right with me. Science has proven that chaos isn’t really chaos, it’s just patterns we can’t easily see with small factors causing big impacts. Yet in organizational and social systems we still have this category of chaos, which is separate from disorder. The advice from the Cynefin model is that when you have chaos, you need to just act, in the interest of getting out of chaos as quickly as possible. This is reminiscent of pre-chaos theory physics where students were told: “stay within the bounds of predictability or Newton's formulas won’t work.” We’re telling people in chaos to get out of chaos because we don’t know how to deal with chaos. This area seems ripe for innovation. What can you do about it? Stay tuned for more WorkBytes Blogtoons on Complexity, we’ll help you through the muck.